Before I went to bed that night I spent some time reading the Bible and reflecting on the idea of excellence in my craft, preaching. While preachers do not preach for the accolades of an arts guild, there should be no less concern for excellence. As ambassadors of The Kingdom our aspirations for excellence in what we do should be exponentially more. Excellence in preaching requires that we be prepared and powerful. There should be a passion in our process from preparation to delivery, a thirst for excellence, an attention to detail. Like a gifted songwriter who makes a deliberate choice with every word, our desire to communicate effectively should be not less, but again, exponentially more. We have the greatest text of all to inspire us; a manuscript breathed by God from which every thought is gleaned. A boring sermon is a tragedy. 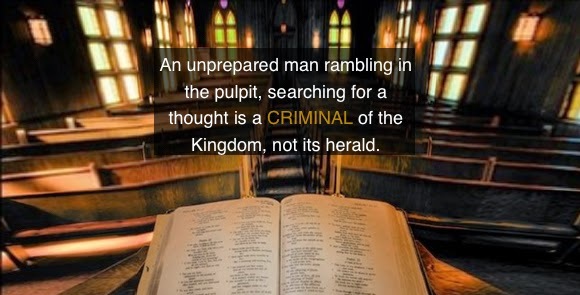 An unprepared man rambling in the pulpit, searching for a thought, is a criminal of the Kingdom, not its herald. I consider 1 Corinthians 2:1-5 to be one of the most misunderstood passages in the Bible when it comes to preaching. The mistake made with this passage is in thinking that an unprepared message is a more powerful one. That somehow it is more of a work of the Spirit if the rest of us are left to sit in the pew for a half hour while the preacher meanders from thought to thought, verse to verse, searching for something decently said that he can somehow attribute to God. Such a show is not the Spirit working, but rather a testimony that you do not care to be prepared. It does not mean you have made more of the Word of God, instead it means you have thought very little of it for days. I have heard many singers stand up on Sunday morning to share a song and preempt their attempt with the words, “Y’all pray for me, I haven’t practiced much this week.” Some sympathetic soul will say, “God bless”, but I say, “Then sit down!” If you did not care to prepare then why should the rest of us care to listen? Is this not for the sake of Christ that you sing, or preach, or teach, or do whatever you do? If it is, then be excellent by being prepared. Otherwise you are being careless. But there is something important in Paul’s words in 1 Corinthians 2 that we should not miss concerning power. Preaching something well prepared, but lacking divine power is human persuasion in the pulpit, not gospel proclamation. Preaching something not well prepared with passion is just yelling for the sake of distracting everyone from your bad preaching. I can’t remember the book in which it is contained or the exact quote, but Calvin Miller quipped something to the effect that a lot of bad preaching has been covered up by loud preaching. Power is not a work of the diaphragm, it is result of a preacher well prepared in study and prayer. Paul was not saying he lacked preparation. He was not even saying that he regarded himself as a bad speaker. What he was saying – he was saying to a hyper-sensitive, overly critical culture that was schooled in the art of rhetoric. Paul was dealing with a group that was so attentive to form that they failed to recognize power. They listened for logic, but had little skill to discern whether they were being moved by the Spirit or by clever persuasion. As guilty as we are in some churches for preaching with power and no form, we are guilty in others of regarding form with no thirst for power. We have heard many good sermons by gifted pulpiteers, but we are in a drought of God ordained power in the pulpit. Paul was not saying he lacked any form. What he was saying was that he may not have met their preconceived ideas of the mannerisms and forms of the culture’s most gifted speakers. I think Paul was actually saying that he was rebelling against their form (lofty speech, wisdom, or plausible words as they would judge it so) for the sake of one thing – power. I would argue that such a feat in that culture would not have taken less preparation, but more. To them it looked foolish, but it was powerful (2 Cor. 2:14ff). Well done Paul! We must be prepared, but we must also be powerful. Not powerful in our own abilities or in cultural formalities, as Paul sought to purposefully avoid, but powerful in Spirit. Personally, in my meditations of these things over the last week or so I am convicted not only to work more diligently to be a better communicator, but to work more deeply to be a more powerful one. As an athlete there were times that we worked on form and there were times that we worked on power. Good form enhances power, it does not diminish it. As a preacher I am often guilty of studying the form of preaching, working diligently to exegete the passage and massage the message, but failing to prepare myself for power. Long hours of reading and writing must be done, but not to the neglect of prayer, meditation, fasting, and suffering. These things are often formless, but they are powerful. As preachers, we will never be invited to the Kennedy Center to celebrate the excellent art of preaching, but we do stand in a more noble cloud of witnesses (Heb. 12). The prophets, the apostles, the saints of God from every nation, the author and finisher of our faith all surround us to see what we do with the Word of God in preaching. We should be excellent both in preparation and in power.